This is it, you’ve read our previous article – the Guide to Betfair Trading for Beginners – and now you’re ready to become a real trader! If you haven’t, you know what to do now. From here on out we’re going to assume you’ve got the basics nailed down. A Betfair account (sign-up here if not). Good trading software (such as Geeks Toy for Windows, or BetTrader for Mac). Become familiar with the Betfair interface and the concept of backing and laying. So, before we begin, let’s just take a moment to see how we’re going to break all this stuff down. 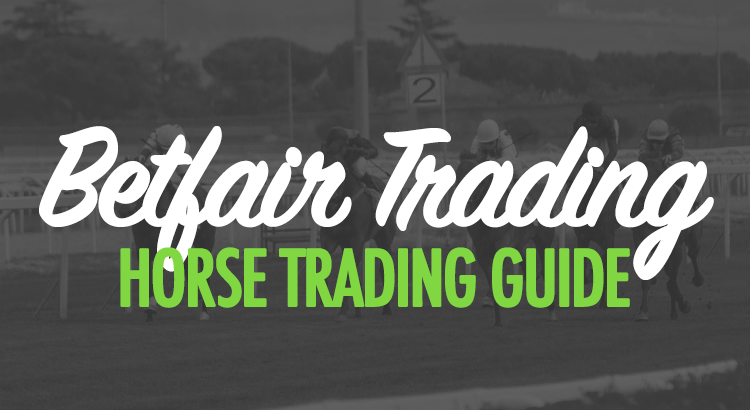 Firstly, in this article, we’re only going to look at how to trade horse racing on Betfair. …But we’ll only be linking what we do here to how it impacts the sport of horse racing itself. The first section will deal with trading strategies which relate specifically to the markets prior to the horses having left their start line. The second section will deal with trading techniques that are more suited to when the horses are actually running. In pre-race trading, the market behaves much more like a real-life stock exchange, albeit in a very time-condensed form. The main approach to trading these markets is called technical analysis. Don’t worry, we’ll discuss this concept in more detail later. For in-play horse trading, when the horses have left the stocks and are running against each other, the price movements are determined, mainly, by the positions of the horses in relation to one-another. Here, a concept known as fundamental analysis can be useful to us. Again, we’ll discuss this at greater length further on. Trust us: this all sounds a lot more complicated than it really is when you get used to it. We’ll begin our overview of pre-race trading strategies with something known as support and resistance trading. Resistance trading is one of those techniques that has come to us straight from the financial markets of Wall Street and the London Stock Exchange. To state it briefly, a resistance point is a price value, or odds value, at which the market will not move beyond. And conversely, a support point is a price value below which the market will not drop. So what are the implications of this? Well, when we seek to trade a race, we can determine these support and resistance points from our trading software, and they can in turn inform us of how best to make a trade. We notice that for the past few minutes a particular horse’s price has been “bouncing” between two points: a high (resistance) price of 5.9, and a low (support) price of 5.1. By assuming that these two prices are indeed resistance and support points, we can make a profitable trade by backing the high price when it nears 5.9 – say, at 5.8 – and then laying when it approaches its support price, say at 5.2. There may be a trend-line of resistance points and support points, but the principle in that case remains the same – back high, lay low. The support and resistance points can sometimes be breached – a ‘breakout‘ event – setting new support and resistance points in the process. Breakout prices are not a rare occurrence; they happen quite a lot, and actually offer a good trading opportunity. When you trade resistance and support points, always be aware that breakout prices can be just around the corner. One of the most important quirks of the online betting exchanges comes in the form of something known as the ‘key prices‘. As you were reading the previous section on resistance points, did you stop to think why certain odds would be resistant to breaches? If you didn’t, take a look back over it now, and all you have to do is start to wonder. Well, psychology does play it’s part. There’s something more going on. Something very fundamental – something crucial to your future success as a trader. OK, we’ll cease with the cryptic tone. What we’re looking at here are the differences in the increments at which the odds prices change on the market depending on the specific price interval. Let’s start by looking at the ‘key prices’. The key prices on the market are: 2, 3, 4, 6, 10, 20, 30, 50 & 100. So, what are the implications of this? It isn’t always so obvious, but if you consider each price change, or increment, as a ‘tick‘, you begin to get the idea. As you can see, by laying at this crossover price, you have made the return vs. loss of one tick in either direction go in your favour. In multiple random selections you will, over time, win more money than you lose. You automatically compromise yourself because an upward tick would mean you lose £2, whereas a downward tick would mean you only win £1. Because of this inequality of return in the tick changes at these crossover points, it makes more sense to lay at these prices rather than to back. So, back to those resistance and support points; it’s now clear that these key prices can act to prevent prices breaking out, because it takes a very large number of backers to breach a price where there are many layers. A good trader should always be aware of these key prices, and trade accordingly. Also, if a price does break through one of these crossover points, you should expect the resistance and support points to change too. You’ll have to assess you position, and depending on how you’re exposed, either close the trade or let it run for a profit. It’s important to note that simply laying at 2.0 – or any other key price point – without consideration for other factors, will be unlikely to prove a profitable long-term strategy on its own. When we trade on the sports betting markets, we are essentially buying and selling odds. And the most fundamental aspect of any kind of trading – whether it is sports betting, the stock exchange, real estate or retail trading – is the idea that the price of the good being bought and sold will fluctuate. But where does this volatility in price come from? What is driving the volatility? Specifically, why do the odds for a particular horse change in time? Well, one answer to this is due to the weight of money. If many people want to back a horse, its price shortens, or comes down. If many people want to lay a horse, its price drifts, or goes up. The beauty of online betting exchanges is that we, the traders, can see exactly how much money is in the market for a certain selection, and how that money is changing in real-time. This allows us to predict the price change given the weight of money in either the back or lay direction. On Betfair, we can see exactly how much money is on the lay-side of the current price, and how much is on the back-side. If there is a significant difference of money between the back and the lay sides of the price, we can use that information to predict the price trend, and either back or lay that price to close out when the price moves in our predicted direction. As with other trading strategies, the weight of money approach isn’t without its pitfalls. Online betting markets have become more efficient, and if the weight of money analysis was all you needed to be successful, then, well, we’d all be successful. But unfortunately that’s not the case. The problem with weight of money calculations is that the market can, in essence, be manipulated. A trader with a very large bank of money can create the illusion that a horse is heavily favoured, but in reality they are just spooking the market, drawing in backers or layers, only for them to pull their orders out of the market at the opportune time. That said, weight of money can be a very good indicator of market trends in heavily traded events. The Cheltenham Festival and Grand National are unlikely to be fazed by a single trader, and in these instances weight of money can be a good friend. To further your knowledge, you won’t go far wrong in learning directly from professional traders themselves. Peter Webb shares a large amount of great tips on the Bet Angel YouTube channel, and Caan Berry shares good information on his channel too. However, the very best information out there doesn’t come for free. After all, why would professionals give away their edge to you – a stranger – free of charge? The tutorials and courses that you can get are pretty good value, though. Caan’s pre-race trading guide (RRP £39) and his advanced video pack (RRP £147) are two of the best guides that money can buy if you’re looking to beat the pre-race trading market. There are many more pre-race trading techniques at our disposal than there are in-race techniques when looking for Betfair trading tips. As we mentioned earlier, pre-race approaches to horse racing rely on something known as technical analysis: this is a financial trading term which implies that our trading decisions are made on market price and volume considerations only. The opposite of technical analysis is known as fundamental analysis. It is this kind of analysis that we’ll employ when we focus on in-race trading. When the online betting industry exploded onto the gambling scene in the early-2000s, in-race trading was something new and exciting. It still is exciting, but the optimism of the early days has been superseded with the acknowledgement that the same old rules apply to this kind of trading as it did in the days before Betfair and internet connections were commonplace. But despite this, in-race trading has definitely opened up some special opportunities; those with knowledge of racecourse peculiarities and handicap ratings can get an edge in the market – and not just in the minutes before the off, but while the race is actually in flux. It’s well worth knowing your horse racing when looking to trade races in-play. The beauty of in-race trading lies, ultimately, in the ability to make use of knowledge of certain conditions and scenarios against temporary odds fluctuations while the race is in-play. Imagine that we know that a horse runs well in the first half of a race, but in the last half its performance is wildly unpredictable. In this case, we would expect its odds to shorten in the first half of the race from its pre-race price, meaning we could back pre-race at higher odds and lay at shorter odds at the half-way point. This is known as a ‘back-to-lay’. Alternatively, we could lay mid-way at low odds with the horse out in front, knowing that there was a good chance it would fall back and then back at subsequently higher odds. Now, the example above might seem an overly simplistic approach, too dependent on a series of ‘ifs’ and ‘buts’. Racecourse layout: does the race finish on an incline, or with a particularly difficult bend? Weather conditions: does a horse favour wet ground or dry? Or is it susceptible to slowing down in hot conditions or cold? Number of horses in the field: where some horses are spooked by many riders, others are spurred on by the competition. Handicap: without a given handicap some horses fly, whereas others perform no differently – does the starting price reflect this, and if not can that be exploited for profit? Jockey choice: will a good jockey get more out of the horse or not? There are so many variables here, and a good trader can use all or any of the knowledge that they have to get in or out of the market at the right time to be successful. With in-running horse trading, this is all now possible. So that wraps up this little excursion into just some of the Betfair horse racing betting tips and strategies you can use when trading.